Is this a chest tumor? My active, normal weight and wonderful female Siamese began coughing about a month ago. There has not been any noticable changes in her activity, eating or litter box. The cough recently became more frequent: day and night, from asleep and awake. So we took her to the vet. They put her on steroids and antibiotics. There was no improvement. Xrays were taken and nodules are in her left lung. The vet has referred us to an internal medicine doctor for an ultrasound. Our appointment is Monday 4/15. Everything I'm reading says that there is not an easy, 100% accurate way to determine what's in the lungs. Is there any other option for diagnosis? I would like to know all of our options before handing out $450 to be told that the ultrasound doesn't show anything. Yueng coughed all of lastnight. It is heartbreaking to see her suffer through those cough attacks. So, I would like to make sure that what we are doing to help her isn't wasting time nor our limited money. p.s. When I get home from work tonight, I will send you her xrays. Hi. Are you able to send the xrays still? I was about to answer the question but if you are able to send an image of the xrays to me this may give me more information. I am heading offline for the night right now, but I'll check in on the question again tomorrow. I just emailed the xrays to your photo@ email address. My vet had to email the xrays again. I was not able to open the photos from the disc that they gave me. Let me know if you did not receive them. Thank you for sending these images of xrays. I have spent some time in photoshop and outlined what the problem may be. 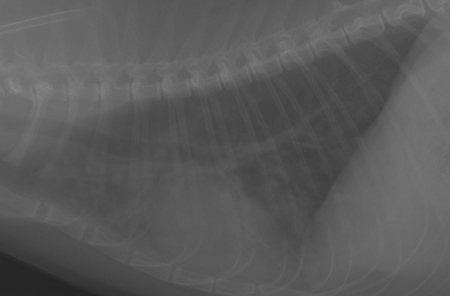 It's often hard to interpret xrays though and this is likely why your vet wants to have further tests done. The problem is though that xrays are super hard to interpret. What I can say is that there is *something* unusual there and the most likely explanation is that this is a tumor. 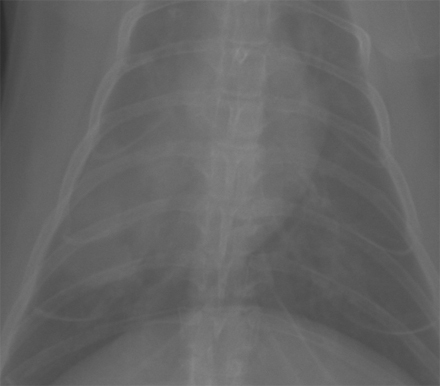 However, it could be that this is a collapsed lung or even pneumonia (that perhaps needs a different type of antibiotic) or a number of other unusual types of things. An ultrasound may give us the answer, but it is not always 100%. If the vet feels it is safe and necessary they may consider putting a needle into this area when they are ultrasounding to see if they can draw out some cells. 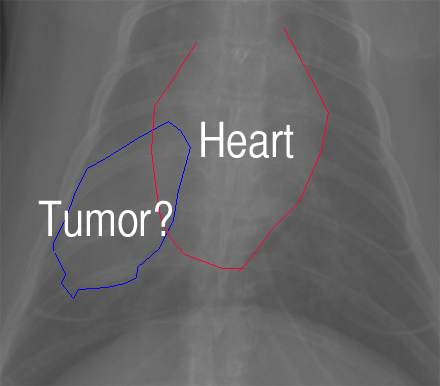 The cells may tell you whether this is a tumor or something else. 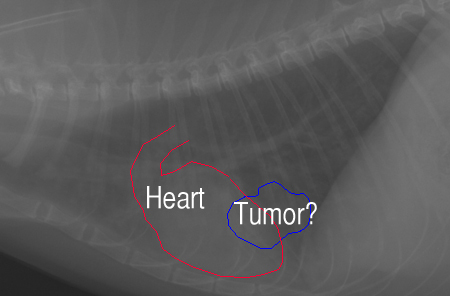 Hopefully it is not a tumor as cats with chest tumors usually do not do well. I hope this answers your questions but please let me know if you have more. I hope that all works out ok.